You know the things you love about British chick lit novels? The setting, the language, the humour, the ridiculous circumstances? 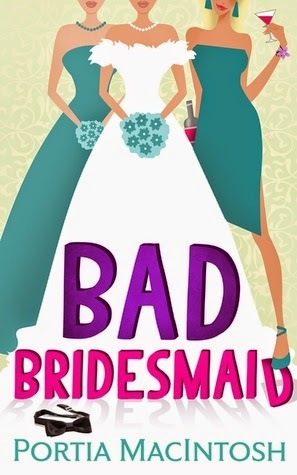 Bad Bridesmaid by Portia Macintosh has all of those things and, thankfully, they all work together to create quite the enjoyable read. I loved that Mia writes romantic comedies. I don't think I've ever read a chick lit novel that has a chick flick writer as its heroine. I find this surprising because it's just the type of profession that lends itself well to these books. Mia's job was fun and interesting but it also provided a way for readers to learn right away that Mia is not one for love. Speaking of love, the romance angle in this book was slightly predictable (hello, it's chick lit) but it wasn't boring. I liked that Macintosh kept me on my toes. I was never quite sure what would happen next and, though I had a feeling I knew who Mia would end up with, there were enough curveballs thrown in the mix to keep the story, and the romance, interesting. I think what kept me from rating this book four stars was Mia's relationship with her family. I couldn't stand (let alone understand) how much they seemed to hate her. There didn't seem to be a good enough reason for all the negative feelings. I cringed every time something went wrong, not because it did (they were usually hilarious incidents), but because I knew Mia would be blamed and there was no reason for it. It just wasn't believable! I also found the ending with her family to be slightly unbelievable as well...things just didn't match up with the way her fam had been acting previously and I didn't see any real change in them by the end of the book. Going back to Mia...I really liked her. Just as her latest movie heroine was a bit of an atypical rom com leading lady, so is Mia a different chick lit heroine. She sleeps around, she's anti-love, she doesn't have many (ok, any) close girlfriends. But her personality is what makes Bad Bridesmaid so much better. She's not bad enough to justify her family's extremely negative reaction to her (see above) but her attitude towards life is interesting to read about. Her opinions are not often shared by a chick lit heroine so it was refreshing to get a new perspective in the genre. Bad Bridesmaid is a really funny chick lit novel. If you're looking for some entertainment for a weekend, Portia Macintosh's novel is for you!